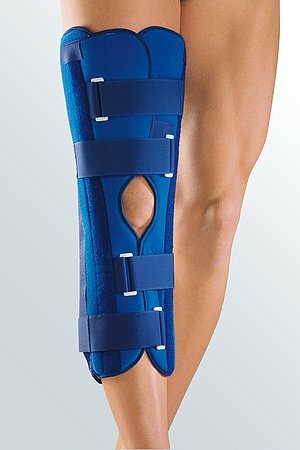 medi Classic Air is a knee immobilising brace. The product is exclusively to be used for the orthotic fitting of the knee and only on unbroken skin or if any wounds have been properly covered. Occasionally pain may develop in the calf during the first few hours of use. If this has not reduced considerably after 24 hours, the doctor should be contacted. You should also contact your doctor in the case of sudden pain. 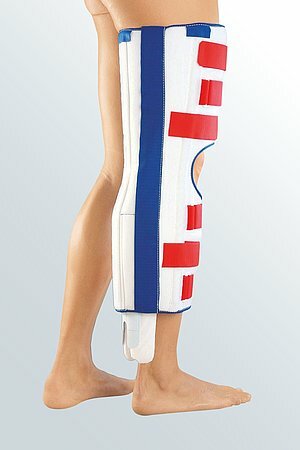 Open all the straps and place the orthosis under the patient‘s leg. Note: The side parts of the medi Classic can be lengthend or shortened. Open the hook and loop fastener on each side and fix it again, in the postion you prefer. If necessary, the medial and lateral rods can be moulded. 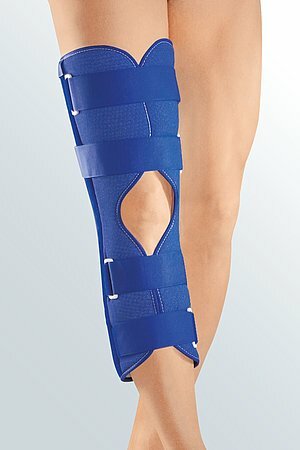 Wrap the sides around the leg so that the kneecap remains uncovered. First close the thigh straps, then the calf straps. Tighten the hook and loop fastener fastener directly above the knee again. Occasionally pain may develop in the calf during the first few hours of use. If this has not reduced considerably after 24 hours, the doctor should be contacted. You should also contact your doctor in the case of sudden pain, swelling, loss of sensation or a feeling of coldness in the foot or if the toes become blue. In this event, while you are waiting for the doctor, loosen the hook and loop fasteners and keep the leg completely still until you are given further instructions. Please close the hook and loop fasteners before washing and remove the ortheses. Soap residues, lotions and ointments can cause skin irritation and material wear. How to use our medi Classic immobilisation braces. Date of issue: until Juni 2017. 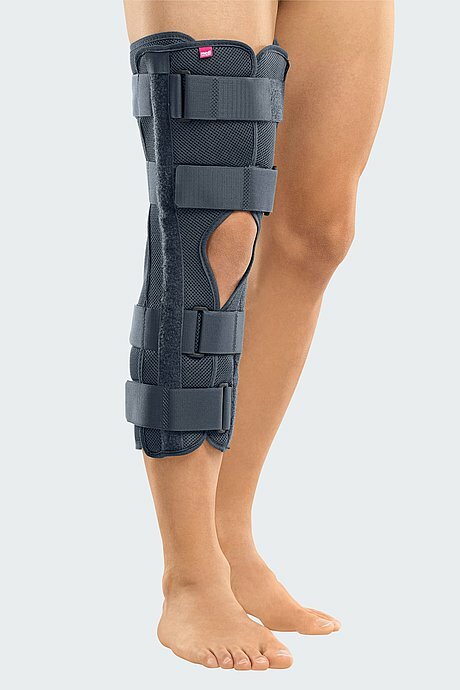 How to use our medi Classic / medi Classic Jeans knee immobilisation braces. Date of issue: until May 2018.